This Thai pineapple fried rice is one of my favorite recipes for busy days! It’s super easy to make, healthy, and so yummy. Plus, it’s SO colorful! 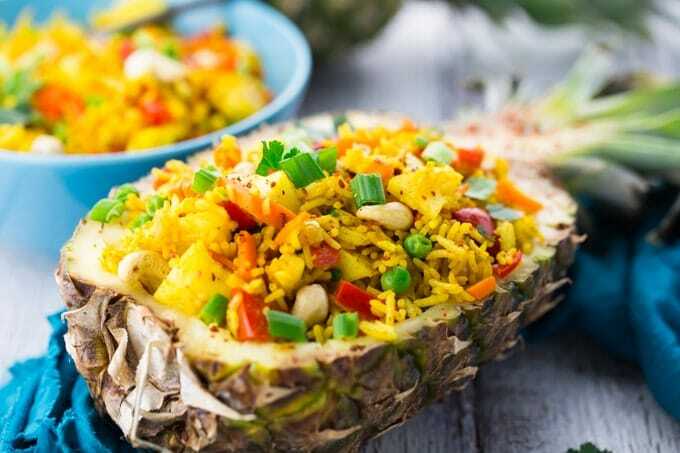 Eating this pineapple rice will be like taking a trip to Thailand! The recipe for this Thai pineapple fried rice reminds me so much of our last trip to Thailand and sunny days at the beach! It was one of my favorite meals there and of course I had to make my own homemade version as soon as I got back home. The pineapple provides this fried rice with juicy sweetness. Curry powder and soy sauce add flavor and spiciness. Red bell pepper and carrots give it some nice crunch and color. Green onions and fresh cilantro leaves provide it with even more flavor and freshness. Green peas add some nice protein. Leftover rice does not only make this pineapple fried rice recipe easier but it also does not clump together like freshly cooked rice would. so delicious – I just love its sweet and tangy taste! ready in only 15 minutes. a great side or even a whole meal just by itself. You don’t need any fancy or hard to find ingredients for this pineapple fried rice. You should be able to find everything in any regular grocery store. As always, you can find the full recipe for this vegan fried rice and the ingredient list in a separate, printable recipe box at the end of this post. STEP 1: I like the Thai pineapple fried rice best with left-over rice from the day before. So cook the rice according to the instructions on the package and store it in an air-tight container in the fridge until you use it. STEP 2: Cook the frozen peas for about 2-3 minutes on the stove top or in the microwave. STEP 3: Cut the red bell pepper and the carrots into thin stripes. Finely chop the onion and the garlic. STEP 4: In a large pan, heat the oil and sauté the onion for about 3 minutes. STEP 5: Then add the garlic, the carrots, and the bell pepper. Cook for 3 minutes. STEP 6: Then stir in the cooked rice and season with the curry powder and the soy sauce. STEP 7: Next, add the pineapple, the peas, the green onion, and the cashews. Season with salt, black pepper, and if using red pepper flakes. Stir until well combined. STEP 8: Serve with fresh cilantro and more green onions on top. Enjoy! We had this so many times during our time in Thailand. Usually right at the beach and not on plates, but in pineapple shells. Do you want to serve your pineapple rice in a pineapple shell like I did? It’s more authentic this way and doesn’t it look super pretty? STEP ONE: Using a sharp knife, cut off about 1/3 of a fresh pineapple. STEP TWO: Make a cut around the edge of the pineapple to make the pineapple bowl. Be careful not to cut through the bottom of the pineapple. STEP THREE: Cut the pineapple into six pieces. Carefully use a spoon to remove the pineapple pieces. Congrats, you’ve got a pineapple bowl! This Thai fried pineapple rice is best when you use left-over rice from the day before. Unlike freshly cooked rice, chilled leftover rice doesn’t clump together or become mushy when being fried. Make sure the pineapple you use for this recipe is ripe. Check out this article that tells your more about how to find out if a pineapple is ripe. For a gluten-free version use tamari instead of soy sauce. If you want you can also add some protein to this pineapple fried rice. I saw that they sometimes add chicken or shrimps in Thailand. My vegan suggestions are fried tofu or tempeh. Prep all ingredients before you start the actual cooking process. The fried rice comes together super quickly, so you won’t have much time for chopping once you’ve started cooking. If you’re looking for a healthier version, you can also substitute the white basmati rice with brown rice. This would also be a good choice for people suffering from diabetes as brown rice has a way better glycemic index. This recipe works best in a wok or in a cast iron skillet. Can you freeze pineapple fried rice? Yes, you can freeze pineapple fried rice. It won’t be as fresh, but it will still be good. However, do not freeze the cilantro and green onions as they won’t freeze well. It works best to freeze the fried rice in ziplock bags. Just take it out of the freezer a few hours before you want to eat it and then reheat it for easy lunches and dinner. I always think fresh is best, but if you’ve got a lot of leftovers, this is definitely an option! What makes pineapple fried rice yellow? I used curry powder to give this pineapple fried rice its yellow color. Where does pineapple fried rice come from? Fried rice is typical of central Thai cuisine. Pineapple rice is one of many popular regional variants. Can I use canned pineapple instead of fresh pineapple? I would always recommend using fresh pineapple for this pineapple fried rice. Fresh is just best! However, the recipe also works with canned pineapple chunks. Just make sure to use canned pineapple without additional sugar. Otherwise the recipe will turn out too sweet. I hope you like this Thai pineapple fried rice recipe as much as we do around here. This Thai pineapple fried rice recipe is one of my favorites for busy days! Super easy, healthy, and so yummy. Plus, it's SO colorful! I like the Thai pineapple fried rice best with left-over rice from the day before. So cook the rice according to the instructions on the package and store it in an air-tight container in the fridge until you use it. Cook the frozen peas for about 7 minutes. In a large pan, heat the oil and sauté the onion for about 3 minutes. Then add the garlic, the carrots, and the bell pepper. Cook for 3 minutes. Then stir in the cooked rice and season with the curry powder and the soy sauce. Next, add the pineapple, the peas, the green onion, and the cashews. Season with salt, black pepper, and if using red pepper flakes. Stir until well combined. Serve with fresh cilantro. Enjoy! This Thai fried pineapple rice is best when you use left-over rice from the day before. Unlike freshly cooked rice, chilled leftover rice doesn't clump together or become mushy when being fried. Prep all ingredients before you start the actual cooking process. The fried rice comes together super quickly, so you won't have much time for chopping once you've started cooking. If you're looking for a healthier version, you can also substitute the white basmati rice with brown rice. This would also be a good choice for people suffering from diabetes as brown rice has a way better glycemic index. Oh yum does this ever look delicious. It sounds perfect for a lovely springs day. I will definitely be trying this recipe. YUM! I love pineapple fried rice and this twist on it. I love the presentation in a pineapple. It looks so pretty! The rice sounds delicious too. Can’t wait to try it! Sina, I am so excited about this recipe! We get pineapple fried rice like this at our local Thai restaurant. They make it vegan for us. But now I can make it at home! This is so beautiful, I love when it is served in a pineapple! I just made this for lunch and it was ABSOLUTELY DELICIOUS!! Presented in pineapple boats for visual pizzazz and for added flavor. Wow, this was so delicious! I’ve never had fried rice like this before. I loved the cilantro, curry, cashews, and pineapple. I can’t wait to make this again, so good. Like send from heaven. Recently started eating more vegan, because I got tired of the hassle of buying, prepping and cooking meat. And I also found out that pineapple are good for my body type so this really is a win-win situation. you are great sine! this is so good. cheers! I’m making this for the second time in 3 weeks. We recently switched to a vegetarian lifestyle and this will be a staple year round. Doing a cleansing month, so going vegan. This recipe was pretty good. Def a keeper!!!! This looks wonderful! I can’t wait to try it! What would you make with it? Yummy, yummy, yummy! Made this last Sunday and my kids and hubby really loved it as well! Going into our weekly routine! Thanks for the recipe! Made this wonderful dish this morning. My family does not jump into eating foods outside their norm but they loved this. I had it for breakfast, my husband will have it as his midmorning snack and my mom plans to enjoy the dish for lunch. I am new to cooking vegan meals and this is my second choice from your site. I also made the tomato and white bean salad twice. Another hit with my family. My goal is to cook every dish in this article. Thank you for your wonderful blog and all of these easy recipes in one place. Everyone in my family of 5 enjoyed this recipe. I’ll be adding to a regular rotation.